Three years ago, I started this little blog. 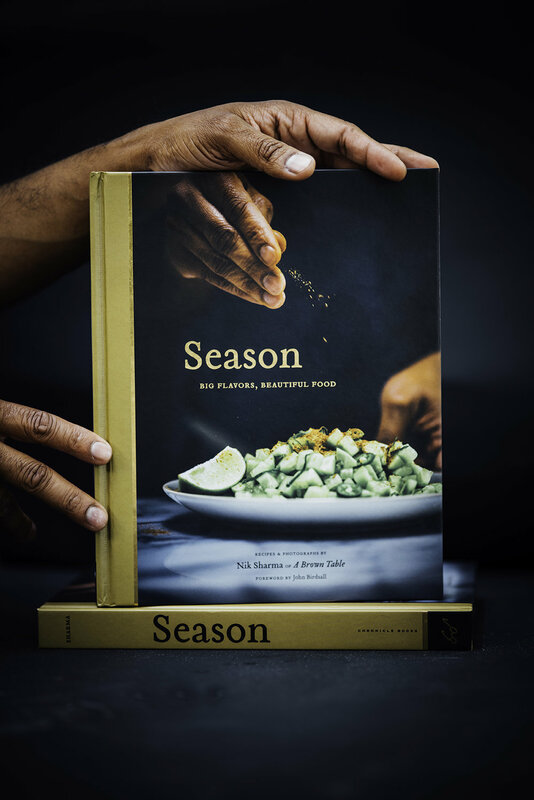 To be honest, I had no clue, no agenda or mission statement, all I wanted was a spot to write about the food I cooked at home, the food that I loved. You see, as a kid, I wanted to either attend culinary school or learn editorial photography but life had other plans and I ended up as a molecular biologist studying physiology and biochemistry. The only goal, I had was to make this my space to learn and indulge in things I loved to do. One of the questions, I get a lot is on food photography and I thought that this bloggiversary would be the perfect time to share my personal experience with you. Equipped with my point-and-shoot camera, I started to photograph the food I prepared at home to share in my posts. Most of those photographs are terrible, styling food would frustrate me, and my early photographs would not get accepted by the "food photography sharing" sites, even after I upgraded to a DSLR. At this point, I was ready to throw in the towel till I spoke to my dad (who used to be a professional photographer until he retired) who gave me probably, the most important advice I have received to date, "practice". Practice made a huge difference in my work. For those of you who want to learn food photography or for that matter any type of photography, I can't stress how important practicing is. Make mistakes in your photographs and learn from them, figure out what pleases you the most about a photograph you took and what doesn't. Then retake the shot and see if you can change things, you are your own best teacher! Listen to what others say but also pay attention to your own instincts. 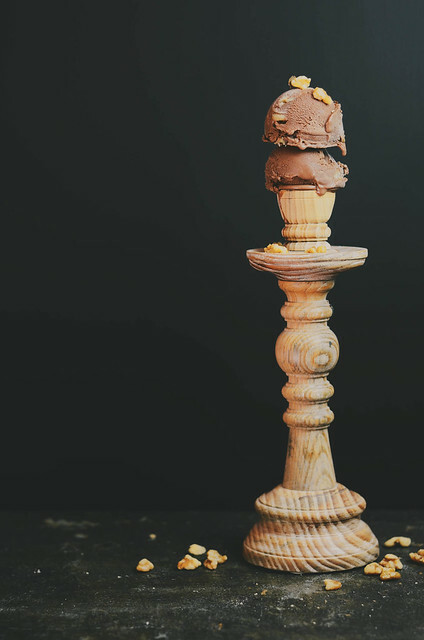 To celebrate three years, I'm sharing this dark chocolate ice cream recipe with you. It's special because it's infused with all sorts of walnut deliciousness in it. 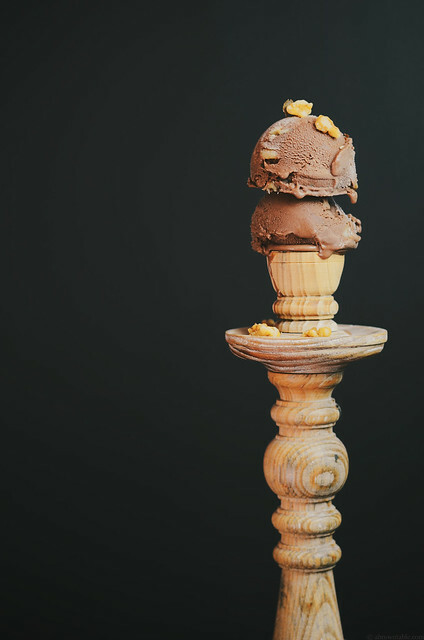 There's walnut oil, a bit of walnut flour and some walnut bits that make this ice cream delicious. 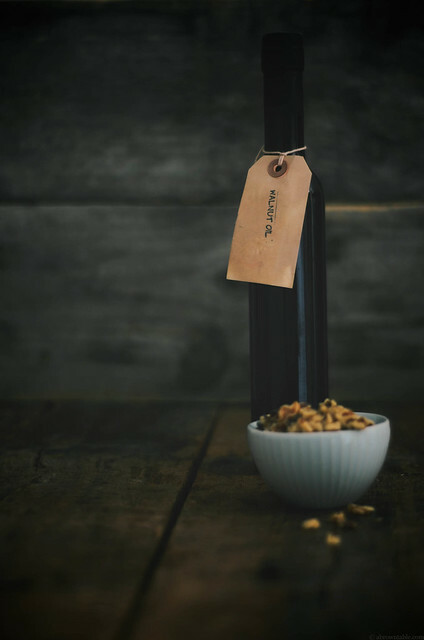 Walnut oil has the aromatic fragrance and flavors of freshly toasted walnuts, it really is amazing and really makes the walnut flavor pop in this recipe. 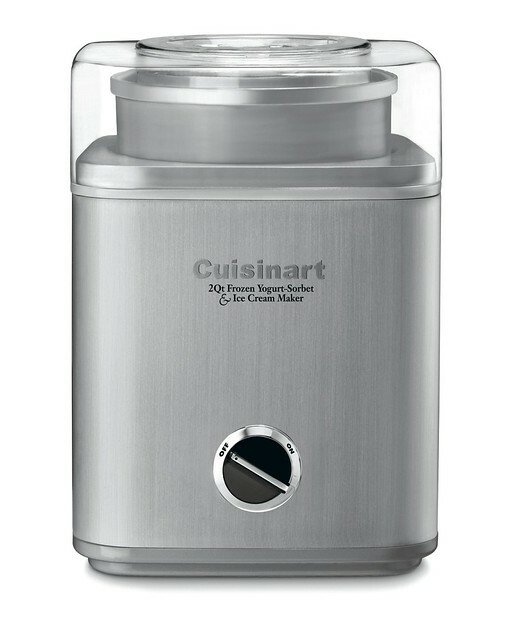 To thank you for all the support and love you have shown me and my work, I'm giving away one of my favorite kitchen appliances, a 2- Quart Frozen Yogurt-Sorbet-Ice Cream Maker courtesy of the super awesome folks at Cuisinart. All you need to do is follow the instructions on the widget below. The giveaway will run from August 4th till August 10th, 2014 and is only open to legal residents of the United States (sorry due to shipping reasons). Good luck! 1. Heat the heavy cream in a thick bottomed saucepan on medium-high until it just begins to simmer. Remove from stove and stir in the chocolate chips, brown sugar, cocoa powder, and salt. Stir until the chocolate chips have completely melted. You might need to whisk the chocolate to combine the ingredients completely. 2. Make a slurry of the cornstarch with the four tablespoons of milk, keep aside. Place the saucepan with its contents back on the stove. Add the 2 cups of milk to the saucepan and whisk until combined. Heat the contents on medium high until the milk begins to boil and boil for 1 minute. Immediately, whisk in the cornstarch slurry. Whisk in the walnut flour. Boil for another 2 minutes, the mixture will thicken to a custard like consistency. Remove the saucepan from the stove. 3. Pour the contents of the saucepan into a clean gallon ziploc bag. Seal airtight and place the bag in an ice-cold water bath to cool or leave in the refrigerator to chill completely. Once the ice cream base has completely cooled, pour in the walnut oil and whisk a little. Refrigerate for another 10 minutes. Transfer the chilled ice cream to your prepared frozen canister of your ice cream maker. Churn for about 30 minutes until the ice cream has formed. Alternatively, follow the instructions given by your ice cream maker's manufacturers. 4. Transfer half of the ice cream to an airtight freezer proof container. Sprinkle half of the walnuts over the ice cream and then layer with the rest of the ice cream. Sprinkle the remaining walnuts over the ice cream. Randomly swirl a silicone spatula or butter knife through the ice cream to distribute the walnut bits. Cover the surface of the ice cream with parchment paper and freeze for at least 4 hrs before serving. 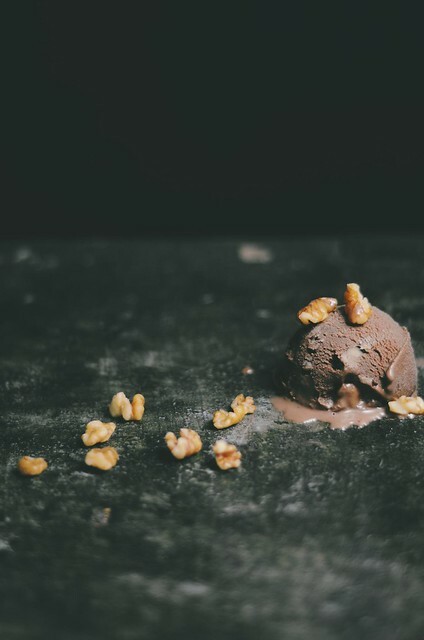 I like to garnish the ice cream scoops with a little extra walnuts right before serving. Disclaimer: I did not receive any financial compensation from the participating sponsor in this giveaway. All opinions stated are my own.